RPC will be conducting a short survey to measure walking and bicycling activity in the community. A total of 1,600 addresses have been randomly selected to complete the survey. The survey will be mailed in April 2019 and will be available on paper and online in English, Spanish, French, and Mandarin. 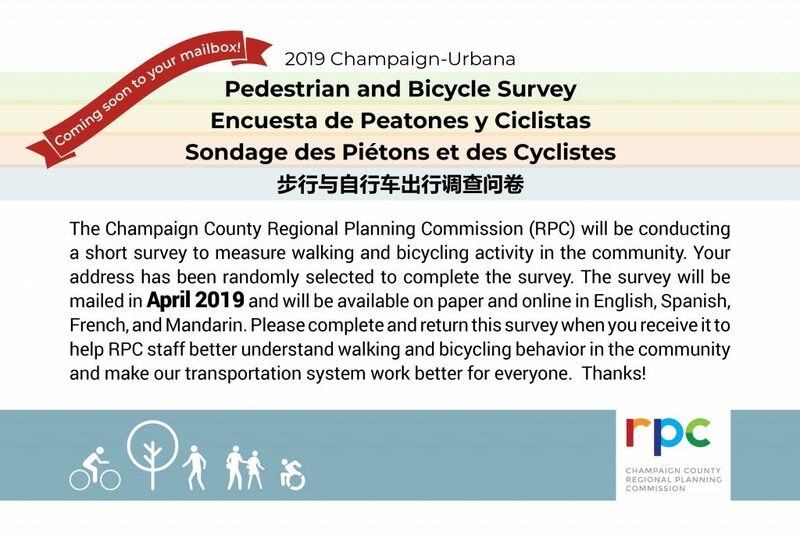 If your household receives a survey, please make sure to complete it to help RPC staff better understand walking and bicycling behavior in the community and make our transportation system work better for everyone. How do I fill out the online survey? I accidentally lost the instructions on our write-in survey and the envelop is also torn. Chris – Thank you for reaching out. I will send the link to the online survey to your email address. If we publish the online survey link it could compromise the validity of our randomized survey sample. If anyone else has this same issue, please email your mailing address to amclaughlin@ccrpc.org and we will send you the link to the online survey after confirming your address is on our survey mailing list. If we don’t hear from you after receiving the first survey in the mail, a second copy of the survey will be mailed to you within a month.